I love to challenge myself with my craft and am always trying to find new things to try. Having a go at the Baby Wipe Technique has been on my list for such a long time to try – so I had a go – and then we created them at class. You get inky fingers – but gee it’s a fun technique that has so many possibilities. Those gorgeous flowers were created my using a baby wipe folded into quarters as a stamp pad. There is a bit of a technique to applying the ink. Limit yourself to 3 or 4 colours – more than that and they muddy together and the image takes on the darkest colour. Apply drops of ink randomly on your baby wipe – start with the darkest colour, then the medium shade in different spots and fill the spaces with your lightest shade. Then simply use this as your stamp pad. The colours I used were Watermelon Wonder, Hello Honey and Mint Macaron. All finished off with some metallic gold designer paper and gold embossed sentiment. The second card I made was using the background baby wipe technique where you fold you baby wipe into quarters and then half again and layer drops of desired colours along the folded edge of the baby wipe. You then wipe this across your card as smoothly as possible. The third method I tried was heat embossing an image onto white card stock using our white embossing powder, then wiping layers using graduated colours. 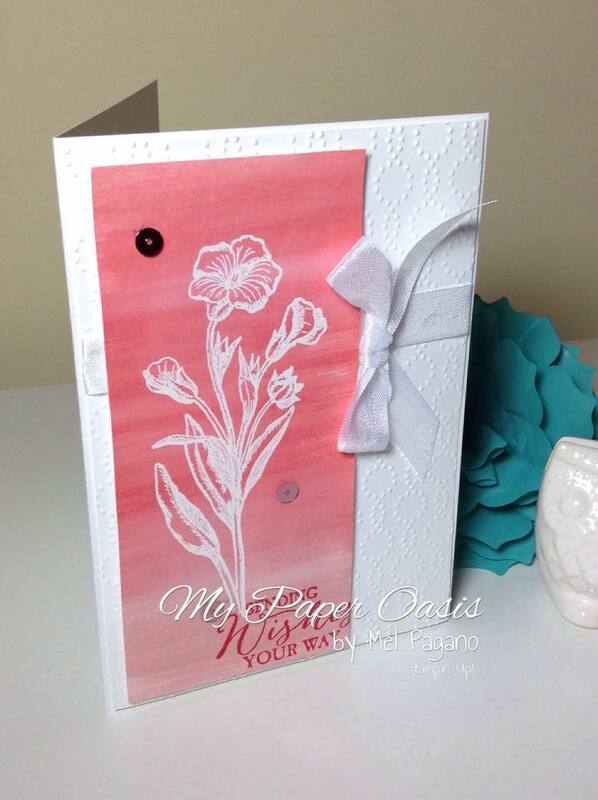 This card I used Blushing Bride, Calypso Coral and Watermelon Wonder. I hope I have inspired you to have a play with this technique, then come back and share your creations in the comments.